Here is a clip of Ryker, Chloe and Emily playing today. An Arizona man is ringing in the New Year with good news after a local animal warden found his dog, which had been missing for a month. Amber the abandoned pit bull mix will soon realize a happy ending to her sad story. Man and his dog rescued as they cling to a steep California cliff. As I reflect on 2011, I realize that it was a pivotal year for The Fort. It was our fifth year in business (some folk say you've "made it" when you hit that number) which was hallmarked by winning Best Doggy Daycare in the South Puget Sound by South Sound Magazine. Time has gone by so fast. It feels like only yesterday Dad (David) was saying, "Man your Battle Stations! ", in all seriousness, while anticipating an eight dog day. Hahaha! My how we have grown, learned and improved over these last five. We shall continue to do so! I can't say what the future will bring. However, I can promise that Fort Fido will continue to provide a superior Dog Daycare service to all in the coming years. As always, we here in "dog land" lol thank you all for your business and support, past years, this year and years to come! We (our whole staff included) take pride in what we do and hope that it shows through in our efforts. With that said, have a safe and happy New Year's Celebration. 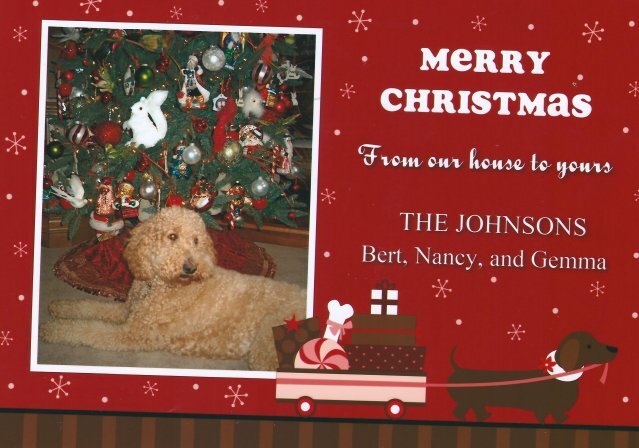 Best wishes to you and yours for 2012. The wife and I will probably be checking out First Night. There was good fireworks one year down by Ruston Way, might do that too. The Fort is open tomorrow with it's regular Saturday hours (9am - 6pm). 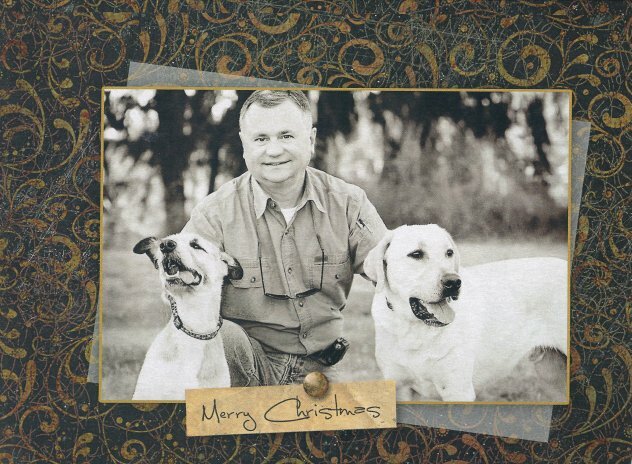 It's a perfect day to get some energy out of your pups before the festivities begin. Drop on in! Also, if you have worked with everyone's favorite Dog Trainer, Garrett Stevens, please leave him a supportive review as well. Garrett has launched his new website recently. His business is continuing to thrive and he is gaining much popularity in the South Sound. Way to go Garrett! Kelsey caught a couple of really cute clips of the little ones upstairs! Check out Pearl and Mooshu tearing it up in the first clip. In the second clip, Henry tells that ball who's the boss! 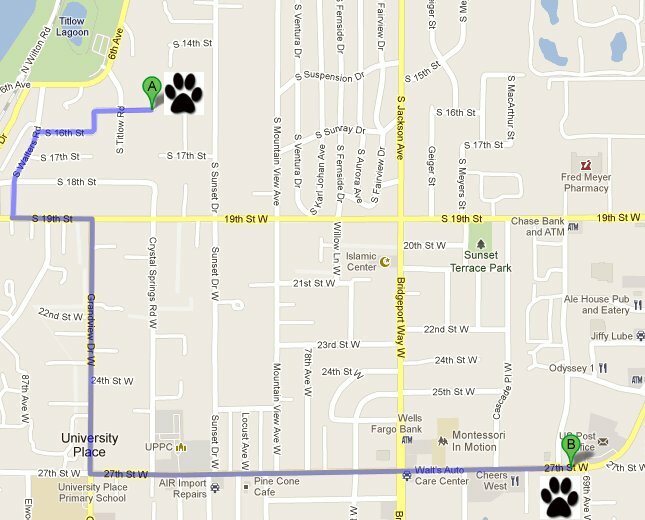 Some neat dog related events are going on in the area this January. The Western Washington All Breed Dog Show will be held from the 14th to the 16th at the Western Washington Fairgrounds. You can see a flier and other information for the event here. The 20th, 21st, and 22nd is the Conconully Super Mush sled dog race, out at Peacock Meadows Sno-Park. This seems like a really exciting thing to go and see--it is the premier sled dog race in the Northwest. Puget Sound Dock Dogs will be at the Washington Sportsmen's Show at the Puyallup fairgrounds during the last week of January (the 25th through the 29th). For a calendar with more pet-related events happening through March, pick up a copy of Pet Connection from the Fort Fido lobby! All kinds of news and a peek at all play areas! I found a lot of dog-related stuff on the internet today, so check out these cool articles! 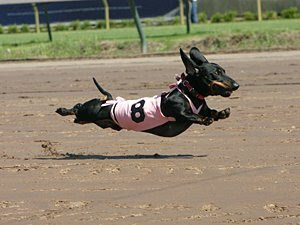 Calvin is the "Fastest Wiener in the West"
Two more dogs saved their families from fires, here and here. A third dog notified his owner that the neighbor's house was on fire. Firefighters found an abandoned dog in a building that was aflame. Pupcake tears it up with her buddies Zeus, Gibson, Hunter, and Gracie in the medium roll. Gem and Abby romp around the big side this morning! Upstairs, Koji was pulling out all the stops to try and impress Cody, while Gherie played with Shih-tzus Samarah and Buddy. 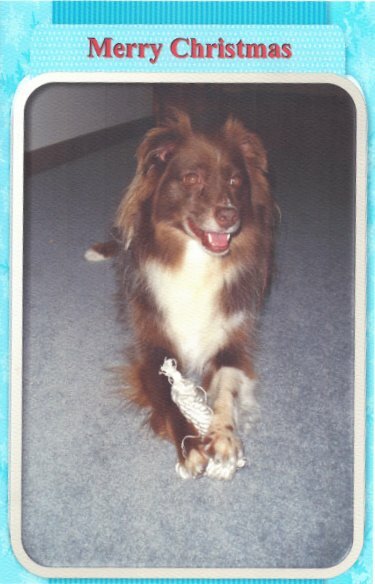 In 1997 Evy Serpa lost her dog Kumpi to cancer when he was only five. This dog expert of over thirty years contracted with a premier nutritionist to create a product line. She was surprised at how far beyond the current concept of premium one could go. Hey everyone! I hope you all had a nice Holiday, we sure did. Got to checkout Warhorse. It was a pretty good film, although there weren't any dogs in it lol. Kumpi arrived today so we've been a bit busy. We apologize for any inconveniences due to it's late arrival. We've been out of the twenty pound bags for a couple of weeks now. Luckily that is over and we are all stocked-up now. Thank you for your patience. Here are a few neat bits from the web I've spotted today. I'll leave you with a fun clip of Tikvah and Miss Phoebe doing what they do best in the Medium Roll. Kate is a 3-month-old Miniature Australian Shepherd whom we welcomed into our Pack this morning. She is a gorgeous little Blue Merle, with a lot of energy! Kate was spunky and confident with the other dogs, although she didn't jump right into the mix. There was a lot of tail-wagging and sniffing around, and she seemed very intrigued by the beautiful Irish Setter Miura. Kate's curiosity and energy level makes me think that once she's more comfortable in the daycare environment (it can all be very new and overwhelming for a little one! ), she's gonna bust out all the stops. We've had quite a few Australian Shepherds of all sizes over the years, and they tend to be a breed that really thrives in daycare. 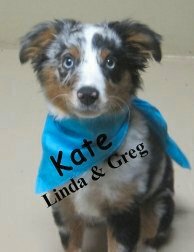 Starting off young is also great--it will help Kate to be well-socialized and build good foundations for communication and pack behavior that will help her for the rest of her life. It was really great having this precious pup join us today! P.S. I also found a neat article about a little pup in Idaho who woke her family when a fire was breaking out in their home. Thanks to that pup, everybody made it out okay. Christmas Fashion at Fort Fido! There wasn't too much going on at the Fort today, so we decided to have a little Christmas Fashion Show! First little Chloe donned her gay apparel, a Santa Suit! Tikvah looked great in that same suit, with matching hat. She really knows how to work the camera. Tikvah also tried on a cute little stocking cap. This girl really likes to get dressed up! Lastly, I managed to finagle Gordon into the Santa hat, though it wasn't long before it was off of his head and into his mouth. Emily tried on the hat for a minute, but only because I held her lunch hostage! Lol. This girl is too rambunctious and excited to play to sit still for long. I also read a couple of very sweet Christmas articles today, including this one about a little girl's letter to Santa. A blind pup, lost and presumed dead, was located and returned home, just in time for Christmas. Talk about a miracle! Some shelter dogs got a visit from Santa's elves, and received much-needed supplies and care this Christmas. P.S. I wanted to share a holiday memory with all of you guys--I remember watching this every Christmas with my siblings when I was a kid. The NORAD Santa-tracker has been a yearly tradition since 1955, when a department store printed the wrong phone number in a "talk to Santa" ad. From those humble beginnings, we now have a massive production, with over 80,000 people calling in to check on Santa's progress and over 2 million people watching the holiday antics online. Well, it looks like Christmas is finally upon us. 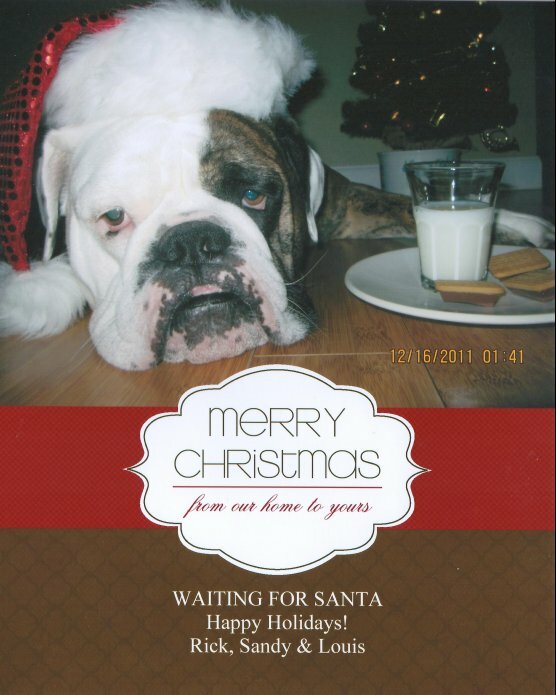 On behalf of the whole Fort Fido crew, Merry Christmas and or Happy Holidays to you all! We thank you all very much for your business, support and positive vibes. We'd also like to thank you for the gifts and goodies you have gorged us with this season hahaha! Thank you! We no doubt have the very best customers and canine companions here at The Fort. Enjoy your family, friends, furry friends and feasts. Have a grand old time, be well, cheers! Take a look, click on each picture to enlarge. Louis's card was another one of my favorites, how creative haha! He always has quite a look on his old Bulldog mug. Briggs, Carona and their owner Gary looking dapper. We received several marvelous cards this year and we thank you all very much! I only scanned the cards that had our Fido dogs on them to show my Blog fans. Don't feel left out... We've put every card received up in the lobby for all to see. Rather, "Santa Butters", is coming to town hahaha! 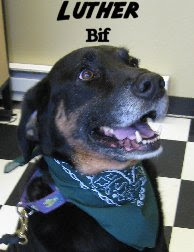 You may recognize Buddy, he is one of Fort Fido's poster boys. 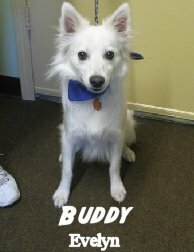 He is a very handsome American Eskimo that has been coming to The Fort for years. You just can't beat his striking look! It's been awesome to use pictures of Buddy for marketing, specifically our Website/Blog Logo. He is one photogenic little canine. 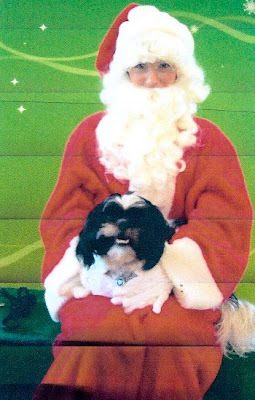 Twas hilarious this morning when Butters came in as Kris Kringle, we had to get a pic of it. Long time Fort attendee, Black Pearl, brought us in some excellent Christmas Cookies. Thank you! Ironically enough, Hope, with Dave's glasses as a prop, looked very similar to the "Cool Santa" depicted on the sugary dough haha! Nancy had to score a photo of that one. I'll leave you with four clips of The Rolls. Two from the Medium, one from the Big and one long one from the Little Roll. P.P.S. Here is Buddy from 2009 in another costume lol! Bear was in bright and early this morning for his assessment. 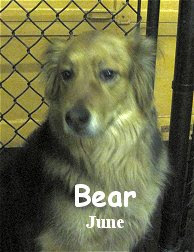 He is a four year old, seventy pound, German Shepherd Mix with a wonderfully beautiful coat. We tried him out in our Medium Roll where he assumed the "Top Dog" position in the pack rather quickly. Bear exhibited good bite control while correcting puppies. He seems to be a fairly well-seasoned alpha, the medium roll is where he'll stay for now. Bear also took quite a liking to Miss Patty. With her charms, she is quite hard to resit, the two frolicked and romped for a large part of Bear's stay. To us, Bear, looks a lot like a German Leonberger, maybe it's the purple tongue? Could be a Chow thing too? Anywho, nice job today pal, we will see you again soon. Scored a great set of photos from friends of The Fort Logan and Hannah. Click on each photo to enlarge. 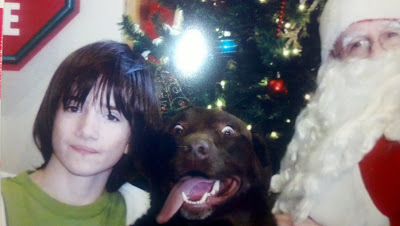 Later that day, Hannah was caught checking Santa's "Naughty or Nice" list online hahaha. Logan was telling her, "Look, if you have to check, you ain't on the nice part sis.". Hahaha! Take it easy this week! Get your canine news fix! A new Broadway musical based on the book Because of Winn Dixie has cast its first canine star! A man in Wisconsin is alive today thanks to his faithful labrador Holly. With the Christmas season so close at hand, there are a lot of people contemplating pups as presents. 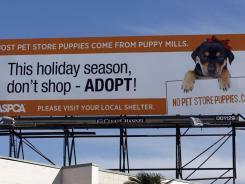 Pet store puppies are notorious for coming from puppy mills, and there are many adoptable dogs that would be just as great of an addition to any family. A 12 year old girl is handling her pup at the AKC Eukanuba National Championship. I'm definitely keeping my fingers crossed for her! Urban mushing is growing in popularity in Mexico. Some are hoping that their country can have an urban mushing race on a scale rivaling the Iditarod someday. One family had a Christmas miracle when their pup was hit by a car and appeared to be dead, only to wake up before burial. A police sniffing dog named after Denver Broncos quarterback Tebow made a big bust at the Orlando airport. A trucker network is helps out families by transporting pets across the country. That's some great volunteer work, and I'm glad to see that these men and women have stepped up. That's all for today, folks! We'll be seeing you back here on Monday. Buddy's ma, Bonnie, sent us an amazing flower arrangement from Buds & Blooms. It is multiple flowers shaped into a very artistic "Santa Dog". Thank you very much Bonnie, this pup brightened our day and has gotten many a compliment! Cortez couldn't help himself, he just had to pose with the new Santy. This morning I found two good links from MSN. Now, I have seen this next link before and it cracked me up, some folks think it's creepy, I guess I'm somewhere in the middle lol. Checkout the book, Yoga Dogs. I was reminded about this book while glancing at MSN's Humorous Holiday Gifts. P.S. Christmas is right around the corner... 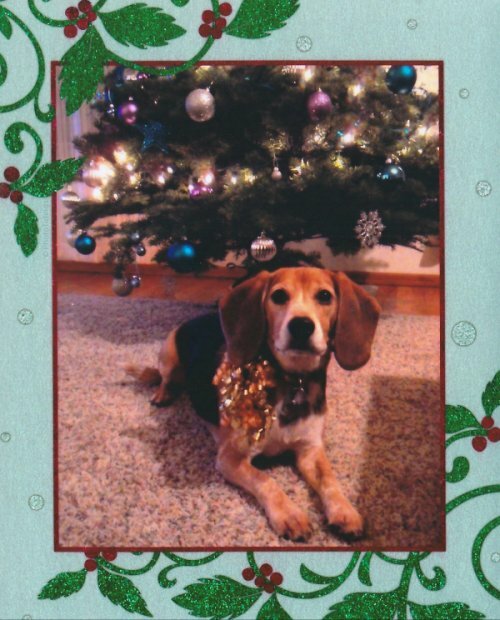 If you need to get some "Holiday Things" done without Fido's help, feel free to drop him or her into The Fort. Please note, we are NOT closing or changing our hours of operation in the month of December this year. Today the Fort got hooked up with a cool new sign! The guys from Clear Channel came out and replaced the whole strip of signs just outside. They were really nice guys, and let us document the whole process. First step--raise the truck bed so that they can reach the billboard. Here's some finagling as they try and remove the old sign. This picture is particularly neat--you can see the old sign beneath ours, showing that a dance studio used to be in this building. The building that Fort Fido occupies was built in the 1950s, and has hosted a lot of different businesses over the years. Here they are hanging the new sign--I really like this color better, it stands out a lot more than the tan sign did. Here is the finished product! Fort Fido, and our neighbor Max-MPG Scooters and Motorcycle service. Just to round things out, here is a clip from each play area today! Have a good night everyone! We received two awesome Christmas cards/photos recently (Click them to enlarge). One from Diego. He is looking as sharp as ever posin' in front of the tree. Note that he is sporting some holiday accessories. So Vogue lol! The other is from Main Man Miller. 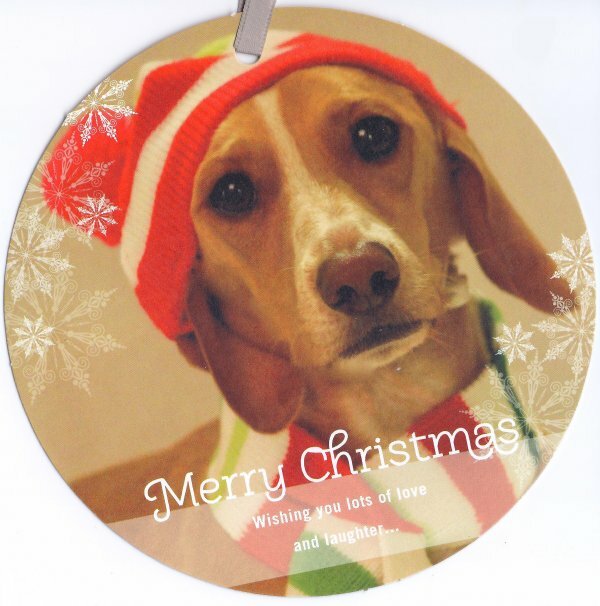 I think this one is spectacular, the card is an ornament that you can actually hangup. Miller is a natural dog-model putting on his best "Blue Steel" for this winter warming pic. 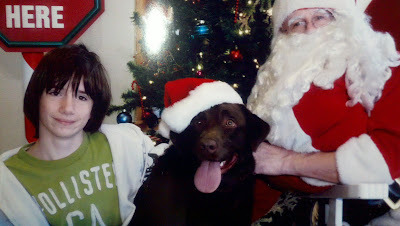 Checkout this great photo of Fort Fido's very own "Buddy" with Santa Claus. It turned out real nice but my scanner didn't do it justice. 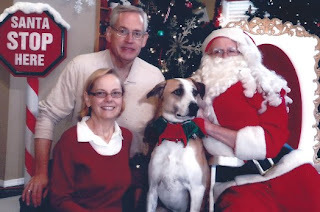 Buddy's owner told me that Bud snagged Santa's beard right before the shoot, haha, typical Buddy style! Also, notice that Mrs. Claus had to fill in for the Jolly guy in this pic lol. Remember, send us in your holiday pet photos (or any pet photos for that matter), they are all Blog worthy and we love receiving them. Two different colored "Golden Retrievers", Lulu & Sam played hard today. The Medium Roll was as wild and boisterous as any day. The Little Roll was also it's high-energy, fun-loving self. Our in-house dog trainer, Garrett Stevens, of Alpha & Omega Dog Training, has been working with us for a couple of years now. 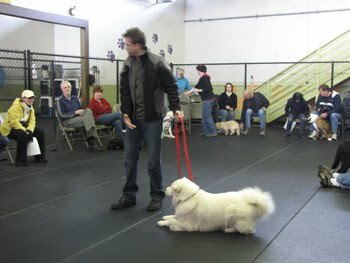 Garrett offers some outstanding dog training classes and seminars here at The Fort. We are excited to announce the launch of Garrett's new website, check it out here. 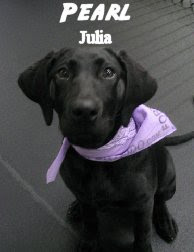 Congratulations Alpha & Omega Dog Training! Another interesting fact is that our main man, Gary, is the Webmaster/Designer of Garrett's new website, too cool, nice job. I am a big fan of Documentaries and Non-Fiction... I've watched several of the neat films over at snagfilms. There are many wonderful, canine related, documentaries on the site. I thought I would list some of them here for y'all to enjoy. Please note, not all of these are total "feel goods", specifically the top two, but they are all very informative none the less. Hope your week has started off well! Walking Fido in a Winter Wonderland! With the cold weather settling in for the next few months, it's important to consider how you are going to keep your pet warm and safe in this weather. The first and most obvious thing is to, of course, limit the amount of time that your pup spends outside in the cold. Especially if there is snow or ice on the ground, time outside should be kept to manageable chunks. More pets are reported lost during the winter than during other times of year--this is because snow and cold can dampen smells and make it harder for your pooch to find his way home. Be cautious, and don't let your pet off-leash in a place where they may become lost. Sweaters, coats, and booties can help to protect short-haired pets from the elements. It may feel a little silly to dress up a dog (who am I kidding, it's adorable! ), but Fido will thank you for the extra layers. I've heard from several pet owners here at the Fort that their pups will refuse to go out in the cold or wet without a coat, instead waiting until they are all bundled up. Can't say that I blame them--I haven't been anywhere without a coat in ages! Protect your pup's pads from the cold and ice by applying something like Musher's Secret. This is a product made from all natural waxes, that coats your pup's paws and protects them from the elements, and any chemicals (such as de-icers) that have been put down to help us two-leggers deal with the weather. Make certain that while walking in this weather you keep an eye out for places that rock salt or other thawing chemicals have been used, and keep Fido from getting too interested! Puddles outside can also act as reservoirs of these chemicals. When you return home, your pup's feet and legs should be rinsed to make sure that no lingering chemicals are waiting to be licked. There are non-toxic alternatives to the typical lime rock salt and calcium chloride salt, that can be used around pets. Morton Salt has a product, aptly named Safe T Pet, that is completely salt and chloride free. It is safer for pets, plants, and people! It's even easier on the concrete than traditional rock salt. Just as you wouldn't leave your pet in the car during the summer, you should also avoid leaving them in a vehicle during the winter. While it is out of the wind, cars can still become very cold in a hurry, and this becomes a serious hazard to pets inside. On the subject of cars--many outdoor cats will sleep beneath the engine of parked cars during the winter, enjoying the last bits of radiating heat. If you park outside, make certain that you make some loud noise and check around for sleeping cats before starting your vehicle. Puppies and older dogs do not tolerate heat as well as adult dogs do, so if you have a junior or senior pet, keep a close eye on how they are doing, and be sensitive to any signs of discomfort that they might be showing. 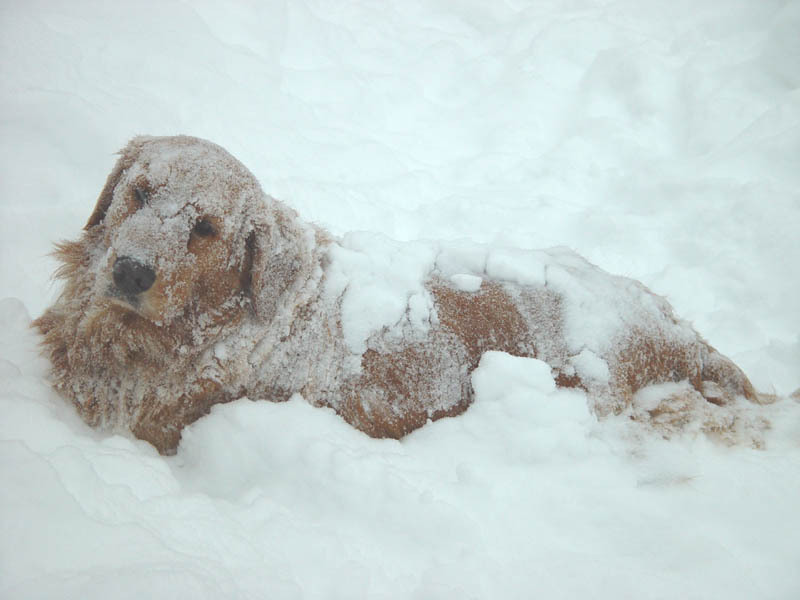 Older dogs especially can have a hard time, if the cold sets off their arthritis. Adequate nutrition from a good food like Kumpi can help to combat this, as well as limiting time spent in the cold. Make sure that any portable heat sources are out of pet range and keep your fireplace blocked off from Fido, to avoid any dangers that the heat may pose. If you have any other tips or tricks for dealing with the winter weather, post them in the comments and let us know! Here are some superb news articles that Hope found earlier today. Here are some clips from the rolls today. First up, two from the Medium Roll. Miss Black Bella has a blast here all the time, look at her make the rounds lol. Fort Fido old-schoolers Annie (Lab Mix) and Sofee (Boston Terrier/Pug/French Bulldog Mix) have been best buddies for a few years now, they are some great dogs. Bubba, Max and Sam were an unstoppable trio of pals most of the day. Last but not least, the Littles. Buddy and Chloe go at it. The chase is on in this one with Chloe for the win Haha! She usually steals the show up there, always doing something fun. Checkout these two awesomely hilarious photos of Jack, Santa and Jack's nephew lol. Click them to enlarge. Thanks for sending those pics in, we love sharing them with everyone. Don't forget to send in photos of your pet outside of The Fort ( Grant@fortfido.com ). 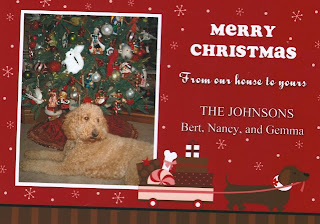 Holiday themed photos of your pet are even better. I'll post them all up here on the Blog. This morning dad (David) was in the lobby greeting customers. While glancing out the window he noticed a dog across the street, near Roundtable Pizza, approaching The Fort. The dog looked very familiar, "Is that Luther?" he thought. He was astonished to find out that it was! Already heading his way, David called for Luther and he happily came into the door then straight into the Big Roll, where he rules the roost I must add. So, Luther decided to bring himself to Doggie Daycare today, ahhh hahaha! Everyone was shocked. We found it very comical, he seemed to have a look on his face like, "Yeah, so what?" lol. In the past we've wondered at the possibilities of something like this happening. The dogs at Fort Fido have a really good time here, for many, it becomes their second home. Everyone is fortunate and relived that Luther, however the heck he escaped, made it here in one piece. He managed to make his way roughly two miles from Crystal Springs Road, near Titlow Beach, all the way to 27th and Bridgeport! He no doubt crossed several busy streets and intersections while avoiding the dog catcher lol! Luther's owner is out of town, the house sitter/dog watcher had no idea how he escaped... His sis Payton was still in the yard and all gates were locked down. Luther is an old pooch but still has quite a bit of spring in his step, maybe he jumped over something? Anyways, good thing he is here and safe now. What a wild morning for all involved! I have had a number of house sitting/dog watching gigs in the past. I know how difficult it can be to keep track of another person's household/pets. I know the sitter and feel for her, she's a great gal and loves these dogs... Sometimes accidents happen! To Luther: No more adventures like that ya crazy man! Short and sweet, twas a busy day. Two from the Medium Roll with the ever so rowdy Buddah and Tikvah. Two clips from the Little Roll, never a dull moment up there. Chloe and Pearl are always getting spunky no matter what day it is. I should have had Mom (Nancy) film my dad (David) and I fixing the big utility sink downstairs this morning lol. Last night, Gary noticed that it was leaking heavily onto the floor! We had to shut the water off so there wasn't any bathroom/cleaning facilities downstairs for awhile. There was also a lot of mopping to do, doh! It was a bummer but luckily we got a new faucet on the thing and it's dry as a bone now. We actually got it fixed rather quickly without any foul language or bickering hahaha! We also got off cheap this time around. The last Fort Fido plumbing fiasco cost 50 times as much and let's just say we needed professional help.